During his 50-minute interview, for which he arrived with armed security, Yousef took shots at Hamas leaders including political chief Khaled Meshaal. He lashed out at Hamas, saying the organization lives in the Middle Ages. And he hurled his most inflammatory comments at Islam, which he called a religion that teaches people to kill. Yousef said he started working with the Shin Bet after he was arrested and witnessed Hamas brutalities inside prison. When he was released in 1997, he started meeting with the Shin Bet and gravitating toward Christianity. Yousef thought he could do some good, preventing the deaths of Israelis and Palestinians. In his book, Yousef clearly relished his importance to Shin Bet and even designed his own missions, one involving duping Meshaal, who lives in Damascus. "I love this spy stuff, especially with Israeli intelligence paving the way," he wrote. "In this way, a new communications channel was established with Damascus, even though Meshaal had no idea that he was actually on a party line with the Shin Bet listening in." Yousef said Hamas has no idea how Shin Bet operates and accused Hamas of killing innocent people suspected of collaborating with Israel. The U.S. government considers Hamas a terrorist organization. Hamas says it provides schools and other social benefits to residents in the areas it controls. Yousef declined to discuss certain aspects of his intelligence relationship with the Israeli security organization, saying he didn't want to hinder its operational capabilities and give Hamas a "free gift." "They're facing a dirty, difficult war," he said, referring to the Shin Bet battles with Hamas. "I don't agree with everything that they do. But their job is very important." His relationship with the Shin Bet lasted for more than a decade until he decided he'd had enough. He ended his lonely and dangerous existence as a spy in 2007. Yousef said the Israelis allowed him to leave the region for a few months to take a break from his harrowing job and travel to America, where he stayed, working as a security guard at a grocery store. When he told his story to his new friends in America, people didn't believe him. But folks seem to be believing him now. His father, a senior Hamas leader, disowned him Monday. Sheik Hassan Yousef said in a letter that his family had renounced "the one who was once our eldest son, who is called Mosab." The son "disbelieved in God" and "collaborated with our enemies," said the father, who's serving a six-year term in an Israeli prison. Mosab Yousef said he didn't take it personally. "I know his heart," Yousef said. "My dad is a loving person. He would never disown me. At some point we will be together again. I love my father, and he loves me." Yousef blamed his father's decision on the Quran. "The God of Quran is trying to unskin Muslims from their humanity," he said, later adding, "Muslims are good people. But their God is absolutely bad." 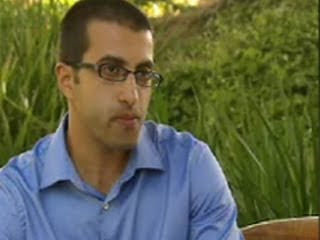 Yousef's claims have rocked Hamas and exposed its vulnerability. His book comes on the heels of the assassination of a top Hamas operative in Dubai in January. Yousef denounced this latest killing in which Israel has been blamed and said the timing of the book was just a coincidence, not some Israeli scheme to generate even more paranoia among the ranks of Hamas. Israel has not commented on Yousef's claims or on widespread speculation that it carried out the Dubai assassination. Asked about why people should believe his book, which was displayed at a Manhattan bookstore's Christian inspiration section, Yousef said: "I am not expecting everybody to believe this story. Some people will doubt it." Yousef said Hamas had no idea how to govern and he hoped the violence between the Palestinians and the Israelis would end. He said he thinks his traitorous efforts will pay off. "A change," he said, "will happen for the next generation."